Top Rated US Seller | Free Shipping | 60 Day Warranty!! Model BNRV500. Nook Glowlight. Nook eReader is in very good condition and has been fully tested. Software is updated to current version 1.3.2. The photo(s) attached are of the actual item(s) you will receive. Barnes & Noble Nook HD 16GB, Wi-Fi, 9in - Slate. Shipped with USPS Priority Mail. Unused. The box is open and has minor damage. This Nook is used and is in good condition. It has been cleared and tested and is fully operational and functions as intended. Because it is used, the screen scratches the corners and the back casing show discolor and contain sticker residue. Barnes & Noble Nook HD 16GB, Wi-Fi, 9in - Slate. Condition is Used. Shipped with USPS Priority Mail Padded Flat Rate Envelope. Tested and working. Has some signs of use (see photos). Some light scratches on screen. Comes with tablet, cable, and charger. If you have any questions, please feel free to ask. If you are unsatisfied with your purchase, please contact me so I can resolve any issues you may have. ITEM: Barnes & Noble Nook HD 16GB, Wi-Fi, 9in - Slate. TABLET ONLY ! Barnes & Noble Nook HD 16GB, Wi-Fi, 7in - Snow Tested . Contents however will not be affected. ANY item can be optioned for pick up. Barnes & Noble Nook 1st Edition 2GB, Wi-Fi 3G (Unlocked), 6in - White/Gray. Condition is New. Shipped with USPS Priority Mail. Samsung Galaxy Tab E Nook SM-T560 16GB, Wi-Fi, 9.6in - Black slightly used case. Condition is Used. Shipped with USPS Priority Mail. Item is still in great condition. Comes with free case and screen protector. Condition is Used. Great for the kids to play and read on or for you to take on vacation and not worry about breaking. Barnes & Noble Nook HD Plus 32GB BNTV600 Tablet. Condition is Used. Shipped with USPS Priority Mail. Barnes & Noble Nook HD 8GB, Wi-Fi, 7in - Smoke Tested . These include, but are not limited to swords, daggers, ninja stars, bb guns, airsoft rifles, etc. Contents however will not be affected. ANY item can be optioned for pick up. Barnes & Noble Nook HD 16GB, Wi-Fi, 9in - Slate. Shipped with USPS Priority Mail. Up For Sale Is A Barnes & Noble Nook HD 16GB, Wi-Fi, 7in - Snow. Don’t worry, we’ll resolve it! Have an issue with your item?. 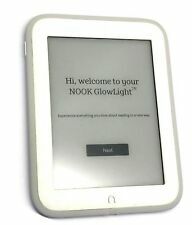 Up for sale is a White Barnes & Noble Nook GlowLight eReader BNRV500A 4GB Tablet. This tablet is fully functional and ready for use. Fully Functional:YES. LCD Screen Functional:YES. Speaker Functional:N/A. Out of Original Box. Great gift must see! Model: Nook HD. This item is in factory box. Up for sale is a Samsung Galaxy Tab 4 SM-T530NU 16GB, Wi-Fi, 10.1in - Black. One can find few very light signs of general usage but otherwise it looks in excellent shape. Millions of books & magazines to choose from. Thousands of popular movies & tv shows. Stunning 9" Full HD display. NEW OPEN BOX CONDITION, ORIGINAL BOX. It would be very much appreciated. The Listing Includes (1) Barnes & Noble Nook Hd 9” Tablet Plus 16GB eReader Touchscreen Color Tablet *** NO CHARGER IS INCLUDED IN THIS LISTING *** Grading A Grade: This tablet is in prime condition, with minor wear on the back and bezel. Please see pictures for details!. Item is in EXCELLENT CONDITION and has rarely been used. I purchased it thinking I would use it but I didn’t. I reset the tablet back to factory settings. Tablet comes in the factory box, literature, power box and usb cord. I am also including the Nook cover for it that also works as a stand to prop it up on its side. I STRONGLY encourage insurance coverage on the shipping as I cannot be responsible for the USPS. If you have any questions, message me. Barnes & Noble Nook HD Plus 32GB BNTV600 Tablet. Condition is Used missing charger but works perfectly . Shipped with USPS Priority Mail. Barnes & Noble Nook HD 16GB, Wi-Fi, 9in - Slate. This Nook was only used a few times as I also have another ereader and tablet. It's practically brand new. It comes with a turquoise cover, power adapter, 30 pin charger cable, official Nook guide and an SD memory card slot. No SD card is included. There are no headphones with this. The original box and paperwork is included. Size and Weight:Height: 6.4" (163.6mm) Width: 4.7" (119.6mm) Thickness: 34"(8.6mm)Weight: 6.9 ounces (195g). Screen and Resolution: A 6" high-resolution, 300-dpi screen with built-in glare-, scratch-, and fingerprint-resistant lens provides a paper-like reading experience. Barnes & Noble Nook HD 32GB, Wi-Fi, 9in - Slate. Shipped with USPS Priority Mail. This Nook HD is in perfect condition. It does not hace a single scratch on the screen. And I am also including a lifeworks case that fits the Nook HD . You will ne very happy with your choice. The Nook HD has a huge screen so it is very easy to read. Barnes & Noble Nook 1st Edition w Leather Case. Screen is clean and free of scratches. Barnes & Noble Nook. Shipped with USPS Priority Mail. This unit is for use in the United States only. Once you have successfully reached the checkout page, simply follow the instructions from there. Speaker, phone jack, and cellular connectivity untested. This tablet has been tested and is 100% fully functional. There are no major dents, dings or scratches. It has slight normal wear but nothing major. Barnes & Noble Nook HD 16GB, Wi-Fi, 7in - Snow. Condition is Seller refurbished. Shipped with USPS Priority Mail. The Barnes & Noble Nook condenses a world of books into a nifty tablet that goes with you anywhere. Boasting user-friendly connectivity, with the Nook, you can find, purchase, download, and read your favorite authors. Browse among the many available options on eBay. What types of Nook tablets are available? Does the older Nook tablet support new content? Yes, it does, and vice versa. The Nook tablet supports several different file types that you can open and read on the older and the newer Nook tablets. The Nook tablet supports both EPUB and PDF, two file extensions you can access across device generations. In addition, any content you purchase and download to your Nook tablet is accessible via the big family of Nook apps designed for a plethora of Android and iOS devices. You also can continue to purchase Nook tablet content from Barnes & Noble, Google Play, and iTunes. How many books and movies can you store on Nook? What's the range of Nook e-reader features? Content provided for informational purposes only. eBay is not affiliated with or endorsed by Barnes & Noble.